The coming day we will start cruising towards the island of Iraklia, which belongs to the group of islands known as The Small Cyclades. Here, release yourself to the simple life with only hints of urban city life. Get away from it all by delving into Iraklia’s interesting legends, myths and one of Europe’s naturally-protected habitats. Iraklia’s rocky terrain gives way to several glorious sand and fine pebble beaches. Tourkopigado: A beach located at the south eastern side of the island, majestically set in a beautiful cove with pebbled coast and clear, cooling waters. The beach is completely untouched and unorganized. Alimia: Located at the south west part of Iraklia, it is a coast of fine sand. Under its transparent green-blue waters a wreck of a German war plane is found which was shot down during the 2nd World War. As such, Alimia beach is the ideal place for snorkeling and underwater explorations. Karvounolakos: Set on the south part of the island between Alimia and Merichas, this sandy beach is small and not organized but has marvelous waters alluring you to stay for hours in them! Around the coast you will see the stunning black rocks while its coast is of pretty light hues creating a unique contrast. Merichas: The beach is located at the south part of Iraklia, in the homonymous cove of Merichas. It is a small steep pebbled beach surrounded by steep cliffs making the scenery stunningly imposing. Merichas cove is ideal for isolation and relaxation while its deep, clean waters will make you not want to leave. Our next destination will be Schoinousa Island, an island of 9.5 square kilometers area that it is recommended for a relaxing, laid-back holiday. The serenity, the vast blue expanse of sea surrounding and the locals’ warm hospitality soothe body and soul so visitors can enjoy the land and its people. Take the chance to explore this beautiful, small island, as we are going to spend our second night here. Our next destination is the island of Santorini, magically curved around the imposing Caldera. Santorini Island is one of the most fascinating, mysterious and awesome destinations in the world. 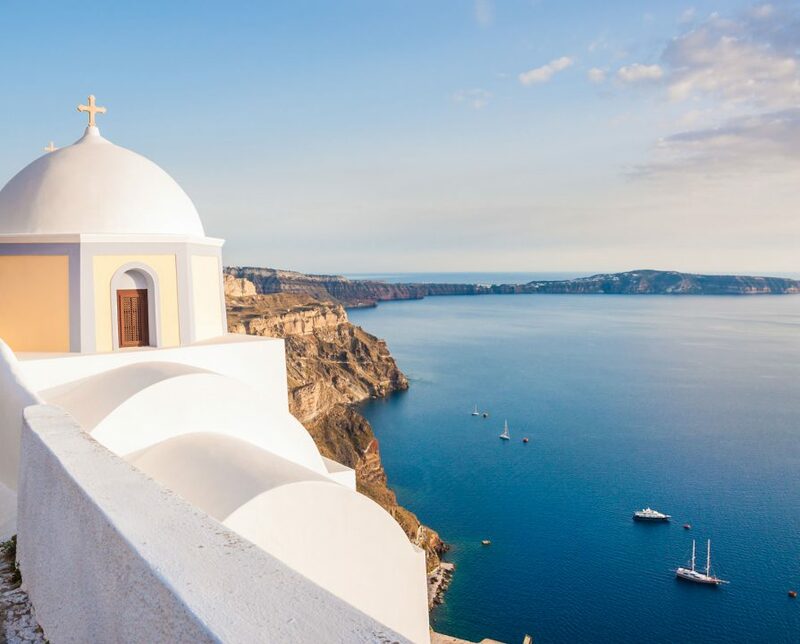 Any stay on Santorini Island should feature a yacht cruise to the three islets which were violently created during the explosion of ancient times, namely Nea Kammeni, Palea Kammeni and Thirassia.